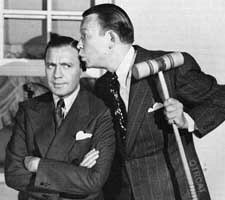 Full of music, comedy, and fun, Hollywood is On the Air has more stars than adog has fleas – Bette Davis, Ruth Etting, Bing Crosby, Phil Harris, Ginger Rogers, Joan Blondell – and that's just a start. Shows are varied and interestiyng – all full of cheer and entertainment. 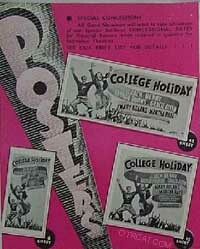 Programs often preview upcoming movies, such as College Holiday (Starring "from California, the land of gals and gags, that gargantuan gagster, that cavorting comedian, that unceremonious master of ceremonies – Jack Benny, along with George Burns, Gracie Allen and Martha Ray) and Love Thy Neighbor (starring the dueling comedians Jack Benny and Fred Allen). One exciting program pays a tribute to the state of Arkansas and those who grow whiskers down to their knees, starring Bob Burns and Martha Ray. So get ready to be impressed, because Hollywood is On the Air, and they are serenading the nation with a program of music and laughter. See also: Radio Fillers, Movie Previews, Leo is on the Air, and Paramount is on the Air. Be the first to comment on "Hollywood is On the Air"